© Chen et al. ; Licensee Bentham Open. Surfactants are commonly used in insecticide formulations as adjuvants to enhance the performance of the insecticidal active ingredients. However, surfactants may have their own intrinsic detrimental effect on insects. In this study, the responses of red imported fire ants, Solenopsis invicta Buren, to 6 polyoxyethylene tridecyl ether surfactants (Ethal TDA) and their relationships to the hydrophilic-lipophilic balance (HLB) numbers were investigated in topical, glass-vial and immersing bioassays. In topical and glass-vial bioassays, significant linear dependence of ant mortality on HLB number was detected and the mortality was negatively related to HLB number. 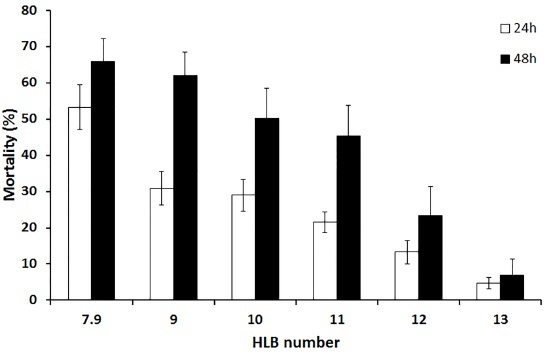 In immersing bioassay, a fast immobilizing effect was observed; however, the time needed to immobilize ants was not related to HLB number in most cases. In conclusion, Ethal TDA surfactants have intrinsic toxicity against S. invicta workers and ant mortality in both topical and glass-vial bioassays was negatively related to their HLB numbers. Keywords: Surfactants, Immobilization, Toxicity, Red imported fire ants, Solenopsis invicta. The red imported fire ant, Solenopsis invicta, is one of the most notorious invasive ants. Native to South America, S. invicta has been introduced into many countries and regions and has become a global pest . Solenopsis invicta is not only a significant threat to public health but also an important pest in agriculture. The ecological impact of S. invicta is also significant . Solenopsis invicta is among the “100 World’s Worst Invasive Alien Species” . Insecticides have been extensively used in controlling S. invicta. From the 1950s to the 1970s, insecticides, such as chlordane, heptachlor, dieldrin, and mirex, were heavily used in the United States in attempts to eradicate S. invicta. After the failure of those eradication programs, tremendous effort has been made in developing alternatives for controlling these ants, including the biological control [4-7]. Despite substantial success in developing biological control technologies, such as the introduction and establishment of phorid flies  and the discovery of S. invicta infecting fungal isolates, microsporidia and viruses , chemical control using synthetic insecticides remains a major tool in controlling S. invicta. Surfactants, the substances that can lower the surface and interfacial tension, are commonly used in formulating synthetic insecticides and biopesticides to improve spreading, wetting, penetration and stability. In addition to the effect as adjuvants, many surfactants do have their intrinsic toxicities against pest insects [8-12]. For example, soaps, salts of fatty acids, have been used for controlling soft-bodied pest insects . Sixteen linear ethoxylated alcohol surfactants were found to be toxic to German cockroaches, Blattella germanica (L.) . Trisiloxane surfactant solutions were toxic to two spotted spider mites . Polyoxyethylene alkylethers and organosilicone nonionic surfactants were found to be highly toxic to green peach aphid, Myzus persicae [9, 13]. Potassium oleate water solution was found to be toxic to S. invicta . Immersion in potassium oleate water solution could rapidly immobilize ants . All surfactants combine hydrophilic and lipophilic groups in one molecule. According to the charge on the groups, surfactants can be classified as anionic, cationic, nonionic and zwitterionic. Nonionic surfactants have no charges on two groups. The balance of the size and strength of these two opposing groups was termed as the hydrophilic–lipophilic balance (HLB) . Griffin developed a method to assign a value, HLB number, to a nonionic surfactant . In Griffin’s system, a surfactant that is lipophilic in character is assigned a low HLB number and a hydrophilic surfactant a high number. Griffin’s method is satisfactory for non-ionic surfactants of various chemical groups. Besides their use in the selection of surfactants to formulate synthetic insecticides, the HLB number was also used in selecting surfactants for formulating hydrophobic aerial conidia of entomopathogenic fungi, Beauveria bassiana and Metarhizium brunneum, from solid fermentation [17, 18]. An optimized surfactant can reduce wetting time, increased conidia counts in suspension, and promote synchronized conidial germination . In a study polyoxyethylene tridecyl ether (Ethal TDA), a non-ionic surfactant with a HLB number 8 performed as a superior wetting agent for M. brunneum. Ethal TDA HLB 8 has been used in formulating entomopathogenic fungi for controlling S. invicta . Ethal TDA surfactants have a general structure C13H27(OCH2CH2)nOH, where n represents the average moles of oxyethylene. Ethal TDA surfactants with different HLB numbers are commercially available and surfactants with intermediate HLB numbers can be easily made through mixing of two Ethal TDAs with proper HLB numbers. They provide a convenient tool to study the relationship between biological effect of surfactants and HLB numbers with minimum change to their chemical properties. In this study, we examined the response of S. invicta workers to 6 Ethal TDAs, with HLB numbers 7.9 to 13, in four different scenarios: 1) mortality after topical treatment, 2) mortality in a glass-vial with surfactant-coated inner walls, and 3) immobilization effect after being immersed in the surfactant water solutions. In topical treatment, the actual amount of surfactant delivered to an ant body is well controlled, which is commonly used for studying the intrinsic toxicity of a chemical. Responses in glass-vial and immersing treatments are relevant to S. invicta chemical control, such as mound drench and dipping treatments commonly used in their quarantine methods. Solenopsis invicta colonies were collected from Washington County, Mississippi. Colonies were maintained in the same condition as described by Chen and his colleagues . All colonies of S. invicta were free of Kneallhazia solenopsae, a microsporidian pathogen. The social form of S. invicta colonies was determined using PCR on Gp-9 alleles. The method described by Valles and Porter was used to amplify Gp-9 alleles . All S. invicta used in this study were from monogyne colonies. Polyoxyethylene tridecyl ether (Ethal TDA) surfactants with 7.9, 11.4 and 13 HLB number were purchased from Ethox Chemical, LLC (Greenville, SC, USA). Ethal TDA surfactants with 7.9, 9, 10, 11, 12, or 13 HLB number were used in this study. The surfactants with intermediate HLB numbers were made through mixing of two ETHAL-TDAs with proper HLB numbers. Compositions of the tested Ethal TDA surfactants are described in Table 1. Table 1. Compositions of tested Ethal TDA surfactants. Mortalities of S. invicta workers after topical treatment with Ethal TDA surfactants were determined. For the ease of handling and obtaining uniform body weight, only large workers were used in the bioassay. Acetone was used as a solvent. The solution (10% w/v) was applied with a 0.779 µl capillary tube. All surfactants were tested at a concentration of 77.9 µg/ant. In the control, ants were only treated with 0.779 µl acetone. Treated ants were placed in a 30-ml capped cup at room temperature (~23 °C) and dead ants were counted at 24 h. Three colonies were originally tested. There were 3-6 replicates for each colony. A single replicate consisted of 17 to 20 ants. In order to assess the ant mortality at 48h, three more colonies were tested. For this, dead ants were counted at both 24 h and 48 h. Mortalities were adjusted by using Abbott’s formula . For analyzing 24 h mortality, data for all 6 colonies were used. A 20-mL glass scintillation vial with metal foil cap liner (Thermo Fisher Scientific Inc., Waltham, Massachusetts, USA) was treated with 0.2 mL surfactant acetone solution. The vial with cap had 44.57 cm2 inner surface area. After the solution was added, the vial was capped tightly, vigorously shaken for 20 second and the lid was then opened under a fume hood for 20 second. The process was repeated until acetone was completely evaporated. Control vial was treated with 0.2 mL of acetone. Once the acetone was completely evaporated, 50 worker ants were placed in the vial. The vial was capped loosely, which allowed air circulation into the vials but prevented escape. Two concentrations, 0.018 μg/cm2 and 0.036 μg/cm2, were tested. Each concentration had three replications and ants from a different colony were used in each individual replicate. All vials were kept at room temperature (23 °C) and dead ants were counted at 48 h. Ants were considered dead if they did not move when probed with a fine needle. Mortalities were adjusted by using Abbott’s formula  before statistical application. Time needed to immobilize an adult ant (Ti) was measured by submerging a single ant into 2 ml surfactant water solution in a 20-ml vial and recording the time needed to immobilize the ant. The surfactant water solution was kept at 30 °C in a water bath. Immobilization status represented the condition when a test ant did not show any movement for at least 20 seconds in the solution. Workers of various sizes were tested. For each surfactant, two concentrations were tested, including 0.01% and 0.1% (w/v). Three colonies were used. Sixty workers from each colony were tested for each concentration. Each ant was placed in the solution using a fine forceps. After Ti was recorded, the ant was dried by transferring it onto a sheet of paper towel and then weighed using an analytical balance to the nearest 0.01 mg. Pure water was also tested. Since ants can float on the water surface, a different procedure was used for the pure water. The vial was completely filled with distilled water. After an ant was placed in the water, the vial was capped with a petri dish. Effort was made to ensure no air bubble existed in the vial. The time needed to immobilize the ant was then recorded. Sixty workers from each of the three colonies were tested in the pure water. Regression analysis was conducted on mortalities in topical, glass-vial and immersing bioassays using HLB number as an explanatory variable (PROC REG; SAS Institute 2008 ). For the data on immobilization effect in immersing bioassay, analysis of covariance (ANCOVA) was performed (PROC GLM; SAS Institute 2008 ), in which HLB was used as independent variable and ant body mass as a covariate. Among 6 colonies used for assessing 24 h mortality, 1.67 ± 1.05% mortality (mean ± SE) occurred in the control. Among three colonies used for 48 h mortality, no mortality was observed in the control. Ethal TDA surfactants caused S. invicta workers 4.68% to 53.20% 24 h mortality and 6.95% to 65.83% 48 h mortality at 77.9 µg/ant (Fig. 1). Since 2.27% to 31.16% mortality occurred in second day (from 24 h to 48 h), Ethal TDA surfactants seemed to have slow acting property. Results of the regression analysis are shown in Table 2. The HLB numbers were negatively associated with the mortality and accounted for 37% and 43% variability in 24 h and 48 h mortalities, respectively. Table 2. Result of regression analysis of mortality data in topical bioassay. r2 was 0.37 and 0.43 for 24 h and 48 h mortality respectively. Fig. (1). Mortalities of Solenopsis invicta workers (mean ± SE) 24 h and 48 h after being topically treated with 77.9 µg/ant Ethal TDA surfactants with different HLB numbers. Fig. (2). 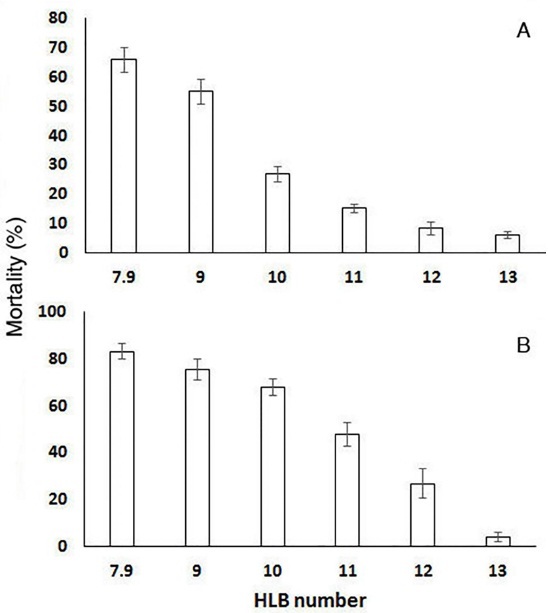 Mortalities of Solenopsis invicta workers (mean ± SE) 48 h after being treated with Ethal TDA surfactants with different HLB numbers at two concentrations (A: 0.018 μg/cm2, B: 0.036 μg/cm2) in glass-vial bioassay. Among 3 colonies, no mortality was found in the control. Ethal TDA surfactants caused S. invicta workers 6.00% to 66.00% mortality at 0.018 µg/cm2 concentration and 4.00% to 83.33% mortality at 0.036 µg/cm2 (Fig. 2). Results of the regression analysis are shown in Table 3, where the HLB numbers were also negatively associated with mortality at both concentrations. The HLB numbers accounted for 81% and 80% variability in mortalities at the concentrations of 0.018 µg/cm2 and 0.036 µg/cm2, respectively. Table 3. Result of regression analysis on mortality data in glass-vial bioassay. r2 was 0.80 and 0.81 for 0.018 μg/cm2 and 0.036 μg/cm2 respectively. Water solution of all tested Ethal TDA surfactants showed a quick immobilization effect against the immersed test ants (Table 4). The data meet the assumption that the slopes relating time needed to immobilize an ant (Ti) to the ant body mass were parallel for all HLB numbers. This was checked by including the class-by-covariate interaction, HLB number*body mass, in the model and examining the ANOVA test for the significance. It was not significant for both concentrations (F(5, 348) = 0.27, P = 0.93 for 0.01% concentration and F(5, 348) = 1.43, P = 0.21 for 0.1% concentration). Type I test was not significant for both concentrations. Type III test was not significant for 0.01% concentration but significant for 0.1% (Table 5). It indicated that there was no significant difference in Ti among HLB numbers at 0.01% concentration whether or not ant body mass was taken into account. However, there was a significant difference in Ti at 0.1% concentration if body mass was used as a covariate (Table 5). Ti for pure water was 230.85 ± 14.78 seconds. Table 4. Time needed to immobilize a worker ant (Ti) in water solution of surfactant. *: Ti for pure water was 230.85 ± 14.78 (mean ± SE). Table 5. Result of analysis of covariance (ANCOVA) on the time needed to immobilize worker ants in immersing bioassay. Polyoxyethylene polymers where the alkyl chain contains a minimum of six carbons were considered as inert ingredients in pesticide formulations applied to growing crops or to raw agricultural commodities after harvest. They are exempted from the requirement of a tolerance when used in accordance with good agricultural practice (U.S. National Archives and Records Administration. 2011. Code of federal regulations. Title 40. Protection of Environment (http://www.gpo.gov/fdsys/pkg/CFR-2011-title40-vol24/xml/CFR-2011-title40-vol24-part180-subpartD.xml accessed on July 15, 2014). In addition, polyoxyethylene polymers are used in many household products (Household Products Database, U.S. Department of Health & Human Services, http://hpd.nlm.nih.gov/cgi-bin/household/brands?tbl =brands&id=18001082 accessed on July 15, 2014). Although Ethal TDA surfactants are usually not used as active insecticides but rather as surface active agents, this study clearly demonstrated that Ethal TDA surfactants were toxic to S. invicta, particularly those with the lower HLB numbers. The HLB number is an excellent predictor of contact toxicity of Ethal TDA surfactant. The contact toxicity decreased with the increasing HLB number. Based on the definition of HLB number , hydrophobic surfactants typically have low HLB numbers, whereas hydrophilic ones have high numbers. Since all tested surfactants have alkyl chain length of 13, the HLB numbers are directly proportional to the oxyethylene content of the Ethal TDA surfactants. The HLB value increased with increasing oxyethylene content. Such trend was observed in several previous studies on surfactant toxicities. For example, in a study on toxicity of linear ethoxylated alcohol surfactants to fathead minnow, Pimephales promelas Rafinesque, and Daphnia magna Strauss, toxicity was increased with decreasing moles of ethoxylation and increasing alkyl chain length (decreasing HLB numbers) . Such negative correlation between HLB numbers and toxicity was also observed on linear alcohol ethoxylates against German cockroaches, Blattella germanica (Linnaeus)  and two cladoceran freshwater water fleas, Daphnia magna and Daphnia pulex . Although the mode of action of surfactants against insects remains unknown, the interaction with biological membranes is believed to be an explanation [26, 27]. Nonionic surfactants can also interfere with enzyme activity by binding with proteins. They can also bind with other biologically important substances, such as peptides . Are HLB numbers also related to those interfering activities? It is possible because different HLB numbers indicate either different chemical structures or similar structure but different molecule size. Both structure and size will affect affinity of the active surfactant molecule to the target site. In contact toxicity, penetration of insect epicuticle is a prerequisite for a chemical to be effective. The hydrophobic nature of the surfactants with low HLB numbers might facilitate their penetration of ant epicuticle thus reaching the internal target sites. No ants were immediately knocked down in topical bioassays. Substantial mortality occurred even after 24 h, indicating that Ethal TDA surfactants are not fast acting toxins against S. invicta. However, all tested Ethal TDA surfactants water solution could quickly immobilize immersed ants. Such quick immobilization effect was also found for potassium oleate, an ionic surfactant with an HLB number of 20 . Fast action without dependence on HLB numbers indicate that such immobilization effect is most likely physical in nature rather than chemical. One possibility is that surfactants help the solution enter spiracle, spread in tracheal tubes and reach each cell in the body to physically shut down the entire respiration system, which leads to a quick knockdown of ants. Immersion in surfactant immobilized ants within minutes; however it took hours of immersion to eventually kill them. This might be due to the slow acting nature of surfactant toxicity and the relatively low concentrations of surfactants in the immersion treatments. Due to their contact toxicity and quick immobilization effect, Ethal TDA surfactants, particularly those with small HLB numbers, may be useful in developing control products for S. invicta. They can be useful in mound treatment products, particularly in liquid formulations for mound drench, which will take advantage of both contact toxicity and fast immobilization effect of the surfactant. Fast immobilization may prevent or slow down the escape of ants from the treated area and enhance the contact of ants with active ingredients. Surfactant may also be useful in immersion treatment for S. invicta quarantine, since submerging quarantined items in a surfactant solution for a prolonged period of time may be practical. One assumable approach is first to submerge quarantined items in surfactant solution to kill ants and then to spray insecticide on the surface to prevent ants from re-entering the treated item. This may significantly reduce the use of synthetic insecticides in quarantine treatments, since bulk amount of insecticide solution for immersion may be no longer necessary. In addition to direct toxicity, surfactants may have profound effect on insect behavior. For example, application of Agral 90 to cucumber leaves (Cucumis sativus) affect plant selection behaviors of the pea leafminer, Liriomyza huidobrensis . The presence of surfactant on ant body and in the nest soil might interfere their chemical signals and prevent nestmate recognition. It was reported that insects use surfactants as a defense mechanism against ants . How surfactants affect ant behavior and its relation with HLB numbers will be an interesting line of future research. We thank Dr. Bal K. Gautam, Department of Entomology, Louisiana State University, Baton Rouge, LA and Dr. Beverly Wiltz, Delgado Community College, New Orleans, LA for critical reviews of the manuscript. We thank Mr. Leon Hicks and Ms. Weihua Jiang for their technical assistance. Trade names or commercial products in this publication are mentioned for the purpose of providing specific information and do not imply recommendation or endorsement by the U. S. Department of Agriculture. Ascunce MS, Yang CC, Oakey J, et al. Global invasion history of the fire ant Solenopsis invicta. Science 2011; 331(6020): 1066-8. Porter SD, Savignano DA. Invasion of polygyne fire ants decimates native ants and disrupts arthropod community. Ecology 1990; 71: 2095-106. Lowe S, Browne M, Boudjelas S, De Poorter M. 100 of the World’s Worst Invasive Alien Species: A selection from the Global Invasive Species Database Published by The Invasive Species Specialist Group (ISSG) a specialist group of the Species Survival Commission (SSC) of the World Conservation Union. IUCN 2000; pp. 1-12. Callcott AM, Porter SD, Weeks RD Jr, Fudd Graham LC, Johnson SJ, Gilbert LE. Fire ant decapitating fly cooperative release programs (19942008): two Pseudacteon species, P. tricuspis and P. curvatus, rapidly expand across imported fire ant populations in the southeastern United States. J Insect Sci 2011; 11: 19. Oi DH, Valles SM. Fire ant control with entomopathogens in the USA. In: Use of microbes for control and eradication of invasive arthropods. Springer Science+Business Media B.V. 2009; pp. 237-57. Williams DF, deShazo RD. Biological control of fire ants: an update on new techniques. Ann Allergy Asthma Immunol 2004; 93(1): 15-22. Williams DF, Oi DH, Porter SD, Pereira RM, Briano JA. Biological control of imported fire ants (Hymenoptera: Formicidae). Am Entomol 2003; 49: 150-63. Cowles RS, Cowles EA, McDermott AM, Ramoutar D. Inert formulation ingredients with activity: toxicity of trisiloxane surfactant solutions to twospotted spider mites (Acari: Tetranychidae). J Econ Entomol 2000; 93(2): 180-8. Imai T, Tsuchiya S, Morita K, Fujimori T. Surface tension-dependent surfactant toxicity on the green peach aphid, Myzus persicae (Sulzer) (Hemiptera: Aphididae). Appl Entomol Zool (Jpn) 1994; 29: 389-93. Olkowski W, Darr S, Olkowski O. Common-sense pest control. Newtown: The Taunton Press 1991. Sims SR, Appel AG. Linear alcohol ethoxylates: insecticidal and synergistic effects on German cockroaches (Blattodea: Blattellidae) and other insects. J Econ Entomol 2007; 100(3): 871-9. Wood BW, Tedders WL, Taylor J. Control of pecan aphids with an organosilicone surfactant. HortScience 1997; 32: 1074-6. Imai T, Tsuchiya S, Fujimori T. Aphicidal effects of Silwet L-77, organosilicone nonionic surfactant. Appl Entomol Zool (Jpn) 1995; 30: 380-2. Chen J, Shang HW, Jin X. Response of Solenopsis invicta (Hymenoptera: Formicidae) to potassium oleate water solution. Insect Sci 2010; 17: 121-8. Griffin WC. Classification of surface-active agents by 'HLB'. J Soc Cosmet Chem 1949; 1: 311-26. Griffin WC. Calculation of HLB values of non-ionic surfactants. J Soc Cosmet Chem 1954; 5: 249-56. Jin X, Streett DA, Dunlap CA, Lyn ME. Application of hydrophilic-lipophilic balance (HLB) number to optimize a compatible non-Ionic surfactant for dried aerial conidia of Beauveria bassiana. Biol Control 2008; 46: 226-33. Jin X, Ugine TA, Chen J, Streett DA. Method for determining the best hydrophilic-lipophilic balance (HLB) number for a compatible non-Ionic surfactant in formulation development for aerial conidia of Metrahizium anisopliae (Hypoceales: Clavicipitaceae). Biocontrol Sci Technol 2009; 19: 341-7. Jin X, Streett DA, Huang Y, Ugined T. Development of a novel bioassay system to assess the effectiveness of entomopathogenic fungi against imported fire ants. Biocontrol Sci Technol 2012; 22: 233-41. Chen J, Cantrell CL, Shang HW, Rojas MG. Piperideine alkaloids from the poison gland of the red imported fire ant (Hymenoptera: Formicidae). J Agric Food Chem 2009; 57(8): 3128-33. Valles SM, Porter SD. Identification of polygyne and monogyne fire ant colonies (Solenopsis invicta) by multiplex PCR of Gp-9 alleles. Insectes Soc 2003; 50: 199-200. Abbott WS. A method of computing the effectiveness of an insecticide. J Econ Entomol 1925; 18: 265-7. SAS/STAT® 92 User’s Guide. Cary, NC: SAS Institute Inc. 2008. Wong DC, Dorn PB, Chai EY. Acute toxicity and structure-activity relationships of nine alcohol ethoxylate surfactants to fathead minnow and Daphnia magna. Environ Toxicol Chem 1997; 16: 1970-6. Maki AW, Bishop WE. Acute toxicity studies of surfactants to Daphnia magna and Daphnia pulex. Arch Environ Contam Toxicol 1979; 8(5): 599-612. Boeije GM, Cano ML, Marshall SJ, et al. Ecotoxicity quantitative structure-activity relationships for alcohol ethoxylate mixtures based on substance-specific toxicity predictions. Ecotoxicol Environ Saf 2006; 64(1): 75-84. Müller MT, Zehnder JB, Escher BI. Membrane toxicity of linear alcohol ethoxylates. Environ Toxicol Chem ; 18: 2767-74. Cserháti T. Alkyl ethoxylated and alkylphenol ethoxylated nonionic surfactants: interaction with bioactive compounds and biological effects. Environ Health Perspect 1995; 103(4): 358-64. McKee FR, Levac J, Hallett RH. Effects of foliar surfactants on host plant selection behavior of Liriomyza huidobrensis (Diptera: Agromyzidae). Environ Entomol 2009; 38(5): 1387-94. Rostás M, Blassmann K. Insects had it first: surfactants as a defence against predators. Proc Biol Sci 2009; 276(1657): 633-8.